AS of late I've noticed that many of the discs making the rounds of my car's CD player are already exaggerated over the radio stations I turn on as an "alternative" from time to time. Not that these acts are unworthy of my Neon's stereo, but every now and again it's good to lend an ear to something fresh, something that's not playing on The Bear or The Bounce, but should be. Something like Michael Bernard Fitzgerald! This Calgary singer-songwriter has a "knack for writing catchy songs and his willingness to create and texture an album with the feel and sound he is looking for," according to that city's Avenue magazine, which reviewed Fitzgerald's latest album The MBF Love LP (2009). "In this case, that feel/sound is multi-layered and big." Fitzgerald and Juno-winning producer Russell Broom (Jann Arden, The Dudes) incorporated actual choirs, a string section and even marching band drum corps for the set, yet the "Most Promising Songwriter" (2008 Ship & Anchor Songwriting Contest) finds a way to keep it simple. And simple is good! I recently checked out MBF's MySpace page, where I clicked on the "play" button for all four available complimentary tracks ("Reach You," "Movie Life," "Amazed," "Care for You"), and was instantly hooked...I guess I'll just have to forgive him for being from Calgary. Fortunately for us, Fitzgerald is stopping in to say hi and sing us some of his "folksy" songs, taking to the stage of downtown's Starlite Room on Thursday, February 11th. 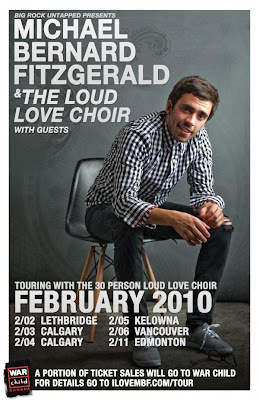 He'll be bringing along the 25-piece Loud Love Choir for a 5-city, 6-show tour of Western Canada that'll also grace Vancouver, Kelowna, Lethbridge and, of course, Calgary. Hailed as "Canada's next best hope for a global star" (Ottawa Citizen), Fitzgerald has also put out the call to local singers to "provide the musical beds behind his guitar and vocals," hinting at his reputation for rallying and bringing the music community together. Tickets for the Big Rock Untapped-sponsored show are just $15 (+ service charges) and are available at Ticketmaster or Blackbyrd. $1 from all door sales will go to support War Child Canada. 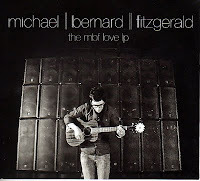 In the video below Michael Bernard Fitzgerald performs his song "Brand New Spaces" with a little help from Lazers & Dangers. that is such a awesome video.I would luv to see him live!!!! I can't stop watching it myself...I think I've seen it about 20 times in the last 2 days! I'm gonna go see him @ the Starlite Room next week, and can't wait! I physically smile EVERY single time I see this clip...MBF really has a talent here, and his other songs (MySpace) are just as worthy. I'm excited to see what happens with his career in the future. He should be a star, no doubt!